« Science and Religion: Competing Paradigms? In my last posting I tried to give a very general view of what happens when protons knock each other inside the LHC beam pipe. Many of the heavy particles produced, like the Z boson, don’t survive long enough to reach any detector. Some of the very light ones, like an electron, a muon or a photon actually travel through lots of material and leave some “detectable” traces. So, as detectives, we collect this information with our gigantic detectors and play around to find everything we can about as many collision events as possible. And yes, you may have just caught what I wrote there : a photon (a particle of light) can pass, in such extreme conditions, a great amount of material. That is very true and happens in every collision of the LHC! So.. What do we do with these traces? We use different detectors which are specialized in the different kinds of particles that can show up. Today I will talk about the detectors with which I worked all my professional life : Calorimeters.. If you look for calorimeter in the Wikipedia, you will find that “Calor” is the latin for “heat”. These are detectors that can measure heat or, in the case of high energy physics, particle’s energy! Well, there is also an entry about Calorimeter in particle physics in the Wikipedia, which, by the way, may need some improvement! In a nutshell, one can think of the particle physics calorimeter inner working as not being very different from the “regular” calorimeter. Particles with very high energies enter, loose their energy and somehow “warm up” some material and a form of thermometer. In the particle physics calorimeter, the incoming particle hits atoms or atoms nucleus of a material which is named the absorber. It does not warm (too much!) that material, but it rather suffers reactions similar to the ones of the protons in the beam. The energy of the particle hitting the absorber will be converted in multiple particles inside the absorber which will carry a fraction of the initial particle energy. This forms a shower of particles in the detector structure. Usually interleaved with the absorbers, another material, the sampling material (the thermometer!) converts a very small fraction of the shower energy in some measurable quantity (light, electric current, etc). If you can estimate precisely which fraction of the energy is lost (so, not measured!) in the absorbers and which fraction stimulates the sampling material (so, IS measured! ), we can figure out the total energy of the original particle! Maybe here, a very curious person would ask why we don’t make a calorimeter only with sampling material. A very simple quick answer is that the amount of sampling material to completely contain the shower and measure a very high energy particle would make a very very big calorimeter (many tens of meters). So, we have to use the absorbers! 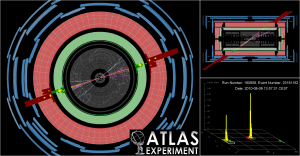 See a shower forming as an electron invades the structure of the ATLAS Electromagnetic Calorimeter in this video. The sound is in English and the subtitles in portuguese. This video is an extract of the “ATLAS – Episode II”, the complete version being fully available at youtube (part 1 and part 2). 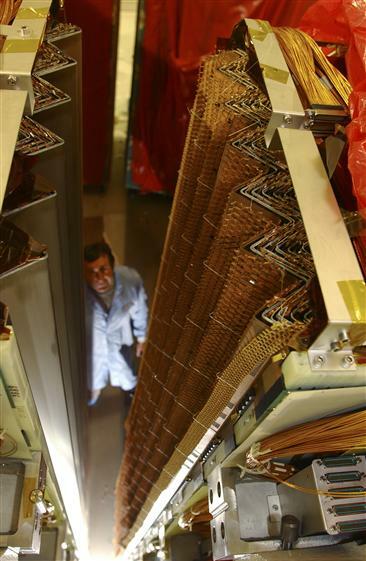 In this case, the absorbers are lead plates organized in a funny accordion shape which convert the energy of the original particle into multiple ones with smaller energy (see the real lead plates here). The sampling material (that initially amazed me a lot) is liquid argon (at -185oC!!). Because of that, the whole calorimeter is installed in a gigantic vessel (see a photo!). We will talk about the sampling process later. The calorimeter is divided into cells formed by the electrodes in the video which collect the energy in a their vicinity. Very detailed algorithms pick up which cells were activated by the shower and calculate the shower energy and geometry. There is another very interesting fact that happens thanks to the absorbers. Imagine that you are a very high speed photon or electron heading to a wall of lead. Since you are an electron or photon you “see” to other electrons thanks to the electromagnetic force, including the electrons from the lead. I find easier to understand if you imagine a wall filled with plastic bubbles (with 100 m diameter) which are the lead atoms. You (the electron) will certainly very quickly hit one ball and loose your speed and energy. Now, suppose that you are a hadronic particle (like a proton or a neutron), you see very little the bubbles. Actually, a hadronic particle interacts mostly over the strong force, so, mostly with the atoms nucleus. If the electron-sphere were 100 m, the nuclei is only a millimeter, so, very, very tiny and with lots of space between then (at least 100 m!). This way, the plastic bubbles disappear and you can now cross a much larger amount of material without finding anything to stop you. So, the shower will start much deeper in the detector, depending on whether you are an electron or a neutron or proton. This way, the calorimeter can cope with two tasks at the same time : They give you a measurement of the particle’s energy AND allow you to perform particle identification. Both tasks make these devices very attractive and quite often found in High Energy Physics. Recently, a calorimeter of lead/scintillator fibers was sent to space in the AMS detector! To illustrate, I picked up two events in the ATLAS Calorimeter. In one, a di-photon, you see that the photons leave two small yellow bands in the green section (EM calorimeter) but never touch the red section (the hadronic calorimeter). In the second picture, of an event with two jets, we see that these, being hadronic like protons or neutrons, cross the full EM calorimeter up to the hadronic one. So, hadronic particles go deeper in the detector as discussed above. Hope you had enjoyed this view of a calorimeter. Next week, I will take a little pause as it is vacation time! But on the next one, I will discuss how to go from the sampling material to an electric pulse in both main ATLAS calorimeters (Lar and Tile, as they are called!!). alguns traços “detectáveis”. Assim, como detetives chegando na cena do crime, podemos coletar estas informações com nossos imensos detetores e tentar descobrir todos os detalhes possíveis num enorme número de colisões! E, sim, você talvez tenha percebido algo interessante que eu escrevi acima : um fóton (partícula de luz) pode atravessar, nessas condições extremas, uma grande quantidade de material. Isso acontece em todas as colisões do LHC! Assim sendo, o que fazemos com tais traços? Usamos diferentes detetores especializados nos diferentes tipos de partículas que possam vir a aparecer. Hoje, eu vou comentar sobre o detetor com o qual eu trabalhei por toda minha vida profissional : O Calorímetro. Se você procurar a palavra “calorímetro” na Wikipedia, você verá que estes são equipamentos que medem calor, ou, no caso da física de altas energias, a energia das partículas! Em inglês, existe também um verbete pra calorímetros da física de partícula na Wikipedia, embora, ele pareça carecer de detalhes. Resumindo, podemos pensar no funcionamento do calorímetro da física de partículas de forma similar ao “calorímetro” regular. As partículas com muita energia entram, perdem sua energia e de alguma forma “esquentam” o material e um termômetro. No caso da física de partículas, as partículas entram num material chamado de absorvedor*, se chocando contra seus átomos ou os núcleos de seus átomos. Na realidade o material não esquenta (muito! Um pouco pode esquentar! ), mas a partícula original sofre o mesmo tipo de reação que os prótons do feixe, ou seja, a partícula vai bater nos átomos do absorvedor e perder sua energia na forma de outras partículas com uma menor energia. Dessa forma, uma cascata de partículas se forma na estrutura do detetor. Normalmente, misturado com o material absorvedor, outro material, chamado de material de amostragem (o termômetro!) converte uma pequena fração da energia da cascata em algo mensurável, tal como luz ou corrente elétrica. Se for possível calcular a proporção entre a energia perdida (ou seja, não medida porque se perdeu no absovedor) e a energia que estimula o material de amostragem (logo, que é medida de verdade! ), podemos calcular a energia total da partícula! Uma pessoa mais curiosa pode perguntar porque não fazemos o calorímetro inteiro com o material de amostragem. A resposta mais rápida e simples é que o calorímetro iria precisar de muito material pra conter a cascata e medir a energia de uma partícula. Assim sendo, o calorímetro ficaria gigantesco (dezenas de metros). Por isso, usamos os absorvedores. Veja como uma cascata se forma quando um elétron invade a estrutura do Calorímetro Eletromagnético do ATLAS nesse vídeo. O som é em inglês com subtítulos em português. Este vídeo foi extraído do filme “ATLAS – Episódio II”, cuja versão completa está disponível em inglês no youtube (parte 1 and parte 2) ou com subtítulos em português no nosso canal ATLAS / Brasil . Neste caso, os absovedores são placas de chumbo organizadas no formato de acordeão que converte a energia da partícula original em várias outras de menor energia (veja as placas de chumbo aqui). O material de amostragem nesse caso (e isso sempre me impressionou muito) é o Argônio Líquido (a -185oC). Por isso o calorímetro está instalado numa vasilha gigantesca (veja essa foto). Falaremos mais sobre a amostragem no próximo post. O calorímetro é dividido em células formadas pelos eletrodos que aparecem no vídeo que coletam a energia numa certa vizinhança das células. Algoritmos especiais conseguem descobrir quais células foram ativadas pela cascata e qual sua energia. Dessa forma, podemos saber a energia e o formato da cascata. Há um outro fato muito interessante sobre os absorvedores. Imagine que você é um elétron ou fóton atravessando o espaço a uma velocidade altíssima. Como você é um elétron ou um fóton, você vê outros elétrons graças a força eletromagnética, incluindo os elétrons das placas de chumbo. Eu creio ser mais fácil de entender se você imaginar uma parede de bolhas de plástico com 100 m de diâmetro que representam os átomos de chumbo na parede. Você (o elétron) certamente vai bater numa dessas bolhas e perder sua velocidade e energia. Agora suponha que você é uma partícula hadrônica (como um próton ou nêutron). Você vê muito pouco as bolhas. Uma partícula hadrônica, na verdade, interage na maior parte das vezes através da força nuclear forte, ou seja, só com os núcleos dos átomos. Se as elétron-esferas, fossem de 100 m, os núcleos teriam apenas um milímetro, ou seja, muito, muito pequenos e com uma grande espaço (pelo menos 100 m) livre entre eles. Assim sendo, as bolhas de plástico desaparecem e você pode agora viajar por um comprimento muito mais longo sem que nada o interrompa. Assim, a cascata vai começar muito mais profundamente no detetor. Dessa forma, o calorímetro pode executar duas tarefas ao mesmo tempo : Ele pode fornecer uma medida da energia da partícula E ajudar na identificação da partícula. Ambas as tarefas fazem com que estes aparatos sejam muito atraentes e muito usados na física de altas energias. Recentemente, um calorímetro de chumbo com cintiladores plásticos foi enviado para o espaço no detetor AMS! 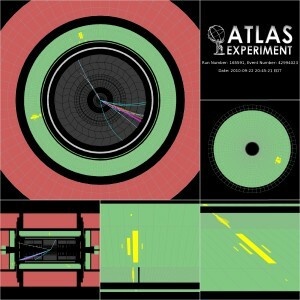 Para ilustrar, selecionei dois eventos no detector ATLAS. No primeiro, um evento com dois fótons, vemos a deposição de energia acontecendo como dois sinais marcados em amarelo na primeira seção (eletromagnética) do calorímetro em verde. Vemos que estes sinais nunca tocam a segunda seção (hadrônica). Na segunda figura, vemos um evento com dois jatos. Cada um dos jatos atravessa o calorímetro electromagnético e chega a depositar uma grande quantidade de energia na parte mais profunda do detetor, como tinhamos discutido. Espero que essa tenha sido uma boa jornada no interior de um calorímetro. Na próxima semana teremos uma curta pausa de férias! Mas na outra semana, vamos discutir como funciona o material de amostragem para produzir um sinal elétrico em ambos os calorímetros do ATLAS (Lar e Tile, como são chamados! ).